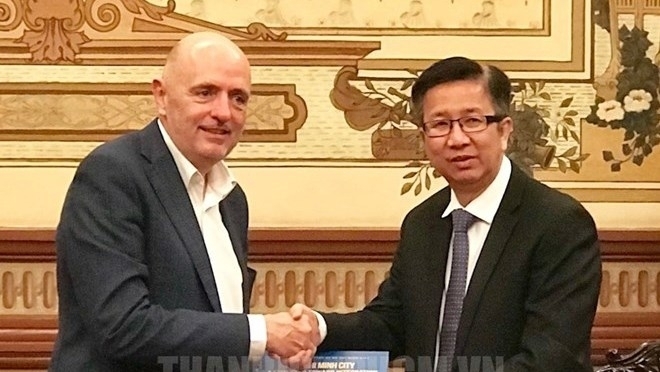 The statement was made by Vice Chairman of the municipal People’s Council Pham Duc Hai at a meeting with a delegation of Belgian parliamentarians – led by Georges Dallemagne, head of the Belgium-Vietnam Friendship Parliamentarian Group – in the southern city on March 11. At the meeting, Vice Chairman Hai said that since Vietnam and Belgium set up diplomatic relations 45 years ago, bilateral partnership has been expanded in many areas, paving the way for Ho Chi Minh city to boost ties in agriculture and seaport development with Belgium and Belgian localities such as the regions of Flanders, Wallonia and Brussels, as well as the Port of Antwerp. Vice Chairman Hai noted that although the economic and trade collaboration between the city and Belgium has been strengthened, the partnership has yet to match the potential and advantages of both sides. He stated that Ho Chi Minh City highly values Belgium’s financial support for the second stage of the project to dredge Soai Rap River, while expressing his hope that the two sides will conduct more cooperation activities in climate change response and environmental protection, as well as in traditional areas of high technology, wastewater treatment, mud settlement, and seaport development. For his part, Dallemagne expressed his delight at the sound development of the relationship between Belgium and Vietnam over the past 45 years. Belgium is very interested in expanding partnership with Vietnam, especially in agriculture, climate change response, and economy-trade, he said. Impressed by the strong and dynamic growth of Ho Chi Minh City, Dallemagne said that Belgium hopes to accelerate delegation exchange activities with the city and strengthen coordination to increase cooperation opportunities in areas of mutual interest, such as dealing with challenges from climate change and urban environmental matters. In 2018, trade between Ho Chi Minh City and Belgium reached US$ 616 million. By January 2019, Belgium had 25 projects in Ho Chi Minh City with a total investment of US$ 6.9 million.